You could say that being in the military was the “family business” in the Westry household. And Nicole Westry happily followed suit. Her father was in the Marines and her mother is still in the Army today. “It really helped her life. Once she got into the military she ended up going back to school. I saw how our lives improved after my mother joined the Army, and I wanted to be a part of that tradition,” says Westry. But before she made that decision, watching her younger siblings join the military themselves, she focused on her academics as a student. To learn more about her success as a graduate student at John Jay College, a First-Level Sargent in the Army, and an aspiring officer, we sat down with Westry and talked about her journey so far. Westry grew up in Atlanta, but had a cousin that went to John Jay. “I had never even seen John Jay, but I kept hearing about this school that focused education on justice, and I knew I wanted to go there,” says Westry. Once enrolled at John Jay in 2002 Westry immersed herself in College life joining student government and volunteer projects, and started an academic career that’s spanned over 17 years. During her time as an undergrad, Westry dedicated herself to helping other students, serving as Secretary on the Student Government Council. 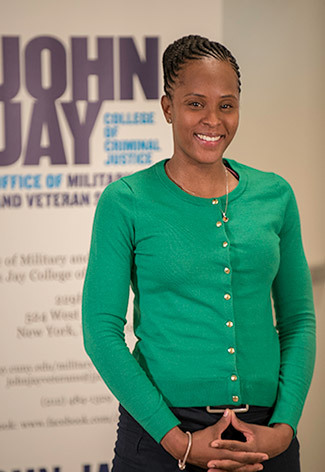 After completing her bachelor’s degree in 2007, Westry immediately enrolled in the Graduate School at John Jay, pursuing a Master’s in Public Administration. In March of 2011, after receiving her master’s degree, Westry went to a recruiter’s office and enlisted in the United States Army. “I was the last in the family to join. They always saw me as a student, choosing academics. After I joined they were really surprised. My mother actually cried, she couldn’t believe that I joined,” says Westry. “She asked me, ‘Are you sure you sure you want to do this?’ and I told her it was something I always wanted to do.” She spent her 30th birthday in basic training, waking up at 4:00 A.M., taking orders, working out, shooting on the range, doing six-mile marches, and learning how to be a soldier. She believes it was during this time that she developed the discipline, confidence, mental and physical stamina essential for every solider. After the six-week basic training, Westry spent seven weeks in job-training in human resources and postal services, then continued on to serve in Afghanistan.